To dream up East End Market we pulled inspiration from many of the North America’s best markets and food hubs. My urban farming ventures have taken much the same path. I recently took a trip to Toronto to meet an inspiring farmpreneur named Jean Martin Fortier, aka The Market Gardener, in hopes of learning a few new techniques. 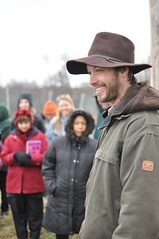 The two workshops I attended put on by FarmStart.ca were incredibly inspiring. First of all to be surrounded by 60+ fellow and future farmers all focussed on learning to grow sustainably and profitablly was a powerful experience. Second, Jean-Martin was a refreshingly affaable and informative presenter. Through a miraid of pictures and stoires, he walked us through his own decade-long farming journey.